We’re adding several new classes to the calendar at the Digital Workshop Center during the next quarter. While we have always offered Microsoft PowerPoint classes, there’s been a recent surge of interest about learning the ins and outs of rival presentation software that we’ll start covering in October — and for good reason. Prezi is one of the latest cloud-based, software as a service (SaS) solutions to create dynamic, engaging presentations. Prezi has changed the game for what can be possible with your presentation. Business meetings and college class presentations will never be the same. According to Prezi.com, “Prezi is a virtual whiteboard that transforms presentations from monologues into conversations: enabling people to see, understand, and remember ideas.” If you spend a few minutes creating a Prezi, the differences between Prezi and PowerPoint are immediately clear. Officially established in 2009, Prezi creates more of a cinematic presentation by incorporating 3D effects, better typography, motion and attention-grabbing animations. All these features are user-friendly and have a modern, sleek look. In addition, there are numerous collaboration features so a team of presenters can work together to build and deliver the presentation. While the focus is on the online, cloud-based service Prezi offers, there is also a desktop version for an offline method to create. The online version is the flagship product and has the most collaboration features available. However, Prezi Desktop is better for confidential information and offers more storage space by virtue of using your hard drive. Prezi also comes at a reasonable to get started. Plans begin with a free plan that keeps all your presentations open to the public, with limited storage space. The standard license is less than $5 per month (or $59 annually), and provides more customizable options like including your own logo. At this pricing level, premium support and greater storage space are also included. Lastly, you can upgrade to the Prezi Pro package for $13.25 per month, which includes Prezi Desktop, more storage space, and all other features. PowerPoint has been a staple of the business and student communities for years, but Prezi may soon knock the once mighty product down a few notches. 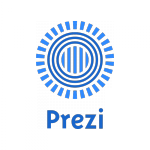 Visit www.prezi.com to start a free trial and learn more about this exciting, new product for presentations.